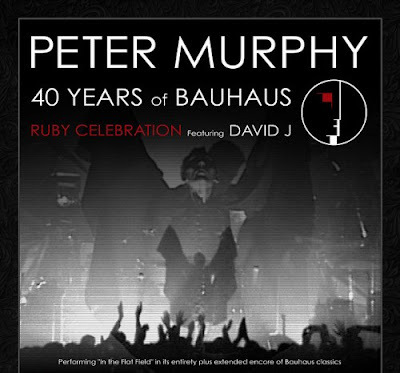 Peter Murphy is on the road in North America with David J celebrating 40 years of Bauhaus. After the tour is over, Murphy moves on to his long-delayed residency at The Chapel in San Francisco which sees him performing his solo albums, plus a "Mr. Moonlight" Bauhaus show with David J. Tickets for the David Bowie tribute at The Chapel went on sale this week and sold out in three hours. Today a second show was added and will take place Wednesday, March 27th. Tickets are available here. Murphy is a huge Bowie fan (despite the unfortunate "bugger off" misunderstanding) and has covered Bowie's iconic songs with Bauhaus and as a solo artist over the years. The tribute shows should be a treat for fans of both legends.